Well folks, I’m mid-way through a second round of book edits, and if I squint hard enough, I think I can see the finish line! I’ve tackled my revision process in two phases. In the first I asked myself, from a big-picture perspective, does it flow? With so many characters whose routes span so many countries, continuity is key. Phase One was a beast. I doubled back often, cut scenes that seemed superfluous (easier said than done), and penned new scenes where there were gaps or where I’d recently discovered pertinent information (e.g., I felt I owed Halina a chapter devoted to her incarceration at the the Montelupich Prison in Krakow). I’m now neck deep in Phase Two revisions, my goal this time to bring each page to life by adding color—sensory-rich details which, I hope, will allow readers to slip seamlessly back in time, and into the well-worn shoes of my relatives. For the book’s early chapters, which are set in the Kurc’s hometown of Radom, for example, I asked myself: What did their street look like? What kinds of clothes did they wear? Did they have a favorite restaurant before the war? Which paper or radio station did they rely on for news? 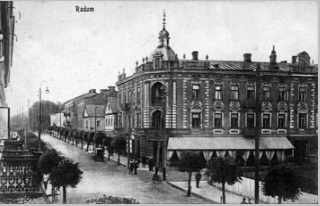 Jakub explained that before the war, this building in Radom housed a famous candy shop and restaurant run by a Mr. Boleslaw Pomianowski. It was known for its live music. It’s fun to imagine that this might have been one of my family’s familiar haunts. In my search for answers, I found several helpful resources, including a collection of photographs entitled, Image Before My Eyes, A Photographic History of Jewish Life in Poland 1864-1939, which offered a strong visual of pre-war Poland. 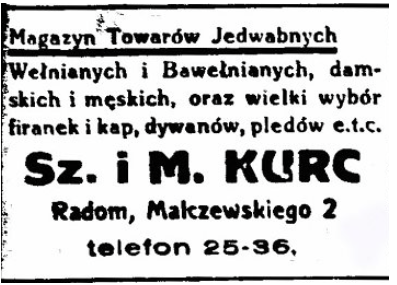 I also discovered a KehilaLinks site on JewishGen dedicated to the study of Jewish family history in Radom, with scores of interesting facts and photos, including an old advertisement for my great grandparents’ fabric shop (at top). I emailed the author of the site, Susan Weinberg, curious about her connection to Radom, and about one of the photos I’d stumbled across (above)—could she tell me the name of the building in it, or perhaps the street? I was also curious about the trees—did she happen to know what kind they were? Minutiae, yes, but the sorts of details I’d been craving. Susan surprised me by replying right away—her grandfather was from Radom, as well, it turns out. You’re in luck, she said. I saw your email while having lunch with a dear friend, Dvora, who is 90, and a survivor from Radom. She’s legally blind, but I asked her about the trees, and she remembers them as chestnuts. Susan went on to describe what Dvora remembered of the city’s 17th century architecture, along with its arts center, which now houses the Resursa Obywatelska, an Arts & Culture Center. I’m happy to ask if Dvora would be open to speaking with you, Susan offered. I also have a contact at the Resursa—Jakub. He’s been my feet on the ground when I need photos of Radom. Shall I put you in touch? Of the thousands of Jewish tombstones that existed in Radom before the war, only 70 were saved–Nusyn Kurc’s was one of them. The others were used by the Germans who occupied the city, to build roads and runways. Dvora and I are scheduled to chat later this week. Jakub has already graciously answered a dozen of my questions. Susan and I email often. 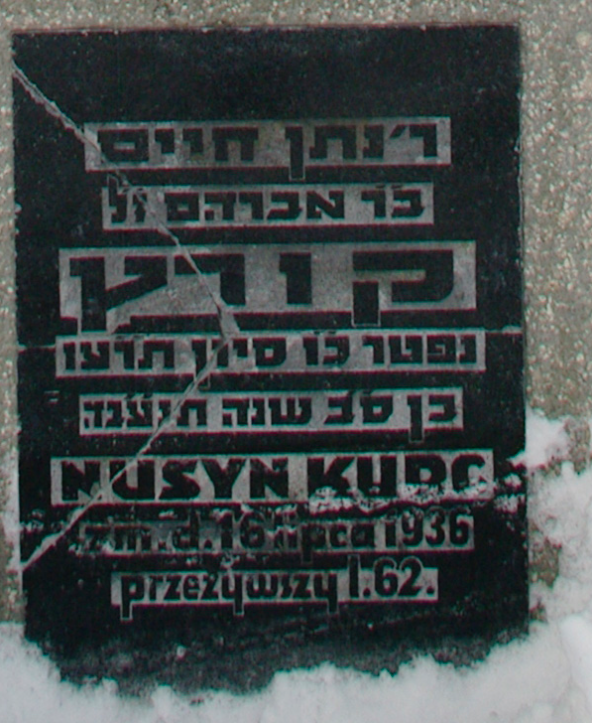 Last week, she sent a photo of a tombstone in Radom she came across in her own research, marked Nusyn Kurc, 1874-1936; I’m in the process of trying to learn if “Nathan” was related. 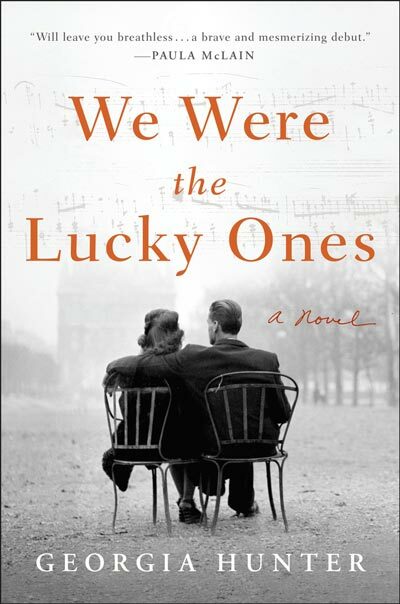 Years ago, I sat down with an empty notebook and a voice recorder to interview a relative in Paris—a first step in the daunting task of unearthing my family’s ancestral past. I’ve come a long way, yes. The end is near. But as thrilling as that is, I’m reminded often that there’s still much to learn. And that you never know when one small discovery might lead to a trove of others. This second phase of research and revision has been tedious as well, but I love it. Each finding—whether gleaned through photos, a conversation, or my own sleuthing through obscure sites and out-of-print books—brings more focus and vibrancy to my family’s story, which is exactly what I need to take The Lucky Ones from good to great. I know that at some point, I’ll need to deem my research complete and step across that finish line…but for now, I’m content to keep on digging. A GoogleEarth image of my family’s old street address in Radom. The entrance to their apartment was at the arch on the right. The Resursa is the white building on the left. Thanks to Jakub, I know now that before the war, the street was called Warszawska, not Malczewskiego, as it is now. I highly recommend a visit to Susan’s blog, “Layers of the Onion, a Family History Exploration,” and to her site, where you can learn the story of how she met Dvora, who inspired a series of beautiful paintings and poems.